Home - Popera Poll week 3 – winner annouced! Popera Poll week 3 – winner annouced! Well done Marc on a fabulous rendition of Nessum Dorma. You have won this weeks poll and we will be sending you £50 of Pizza Hut vouchers so go and spoil yourself with some free Pizza! Marc Worrall will also receive some Popera goodies for his video. Thank you to everyone else for taking part and well done for reaching the final selection. 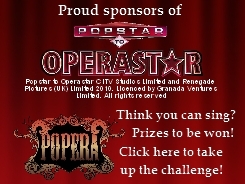 So no matter what your profession is, everyone can sing a bit of Opera therefore why not give Popera a go and be in the chance of winning some great prizes.